If you haven’t watched ‘The Battle Of The Bastards’ yet then do not read any further – or at least accept you are only spoiling it for yourself. In episode nine of Game of Thrones’ incredible sixth season, fans were treated to an epic battle scene which saw Jon Snow fight Ramsay Bolton for control of Winterfell. Ramsay had the numbers, but Jon and his men had heart – and a massive giant who wasn’t afraid to tear through his own flesh to open the gates of the contested keep. Measuring in at an almighty 7ft 1in Ian Whyte – who plays Wun Wun – doesn’t only tower over his co-stars on screen. According to the Daily Star, Whyte also enjoyed a spell as a basketballer before switching his career focus to entertainment. 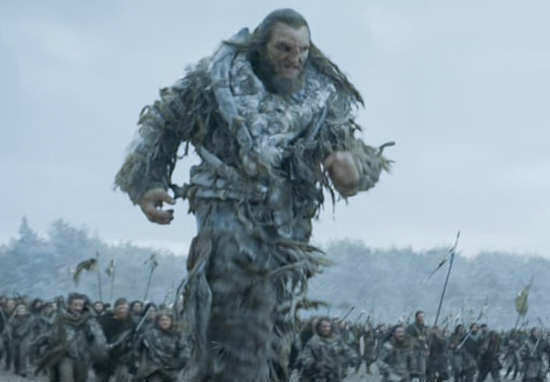 After being introduced to Wun Wun in season five during the battle at Hardhome, the man-mountain made himself key to Jon Snow’s success, as he sacrificed himself so that the Starks could reclaim their home. But it turns out we have seen Whyte earlier in the hit HBO show. He also played a White Walker, and Gregor Clegane in earlier seasons. Farewell Wun Wun – you did not die in vain.